"The Mogami Gold cables have been an essential piece to my studio and live setup. They keep my tone clean and free from interference. I can say from personal experience these are the most durable and well-made cables for live performance. No other cable comes close, and that's why I only use Mogami." 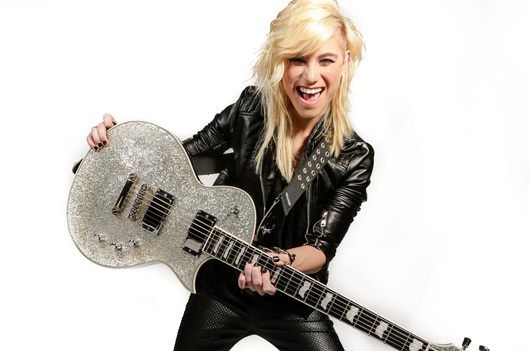 Sydney Ellen is a lead guitarist, songwriter and composer, currently performing as a solo artist, hailing from Southern California. While maintaining her live performance schedule, Sydney is writing and recording original work, slated for upcoming release in 2017. A multi-faceted prodigious musician, Sydney was first a trained pianist at age five. Growing up listening to Classic Rock and being heavily influenced by the performance style of Jimmy Page, Sydney expanded her musical talent to the guitar and eventually songwriting and composing. After over a decade of curating her skills, Sydney earned a scholarship to the prestigious Berklee College of Music, and still dedicates herself to perfecting her craft every single day. "I instantly became obsessed with this instrument," says Sydney of her guitar, "and it's an obsession that will go on forever." Equipped with unrivaled talent and extensive educational pedigree, Sydney has made a seamless transition from dedicated student to professional musician. No stranger to the stage, Sydney has years of experience performing Classic Rock, Metal, Jazz, Funk, Motown, and Pop, but perhaps her greatest skill is her ability to perform on stage with an enviable sense of ease- - a skill that has left her decorated with numerous awards as one of the top rising female guitarists in the rock scene. "I was taught that every time I'm on stage it's my obligation to really put on a show. The audience came to be entertained, and I want them to feel that they got what they came for." says Sydney. Paying homage to this mantra, Sydney has garnered a rapidly growing worldwide fan base. Her cutting edge look coupled with her musical talent and stage presence has earned Sydney various endorsements and sponsorships from clothing and accessory companies, equipment vendors, hair stylists and makeup artists.